Daikin is Australia’s leading air-conditioning manufacturer. Hearth House has fully trained staff to help you design the perfect system for your home. All Daikin ducted systems come with the following features. 5 Year Warranty – Daikin is consistently judged as the most reliable air-conditioner in Australia. Daikin back this up with their 5 year parts and labor warranty. Economy – The intelligent Daikin inverter adjusts the power to suit your needs. Indoor thermostats match your temperature requirements keeping you comfortable while running more efficiently. DC Fan MotorM – Daikin Indoor Units are equipped with a variable speed high efficiency DC fan motor. By utilising high power permanent magnets instead of the induced magnetism of conventional AC motors, Daikin’s DC motor can deliver significantly higher motor efficiency. The DC motor control system can also be set to one of fifteen different fan speed ranges to allow your installer to precisely match the airflow to your ducting configuration. Daikin’s NAV EASE controller is the standard controller accompanying your Daikin ducted air conditioning system (FDYQ (N) Models) giving you simple, one-touch control over your in-home comfort. 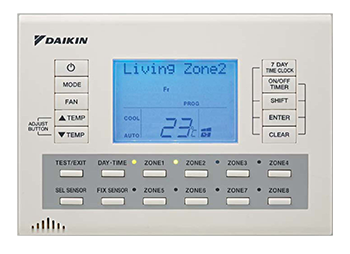 Daikin’s ZONE CONTROLLER was developed in Australia specifically for Australian and New Zealand conditions, with innovative features to give you the precise control you need for ultimate comfort across your whole home. With four models available, a ZONE CONTROLLER is the ultimate solution for tailoring your Daikin ducted air conditioning to your exact needs, for optimum comfort – where and when you want it. 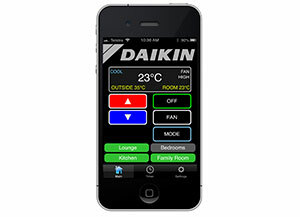 Daikin SKYFi puts your air conditioner’s frequently used functions at your fingertips with an easy to use app. In conjunction with Daikin’s BRP15A61 SKYFi Interface, the easy to use Daikin Daikin SKYFi controller lets you use your smartphone or tablet to control your Daikin Ducted air conditioning via Wi-Fi or the internet. 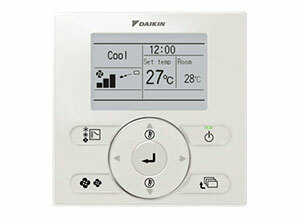 Interface and Installtion charges may apply – Contact your Daikin Specialist Dealer for more information.